The end of November is here and here is your last Rockport fishing report for the month. We are ending the month on a fairly high note, after enduring a bit of tougher weather earlier in the month. Hopefully these trends continue and things continue to fish well as we move ahead into December. 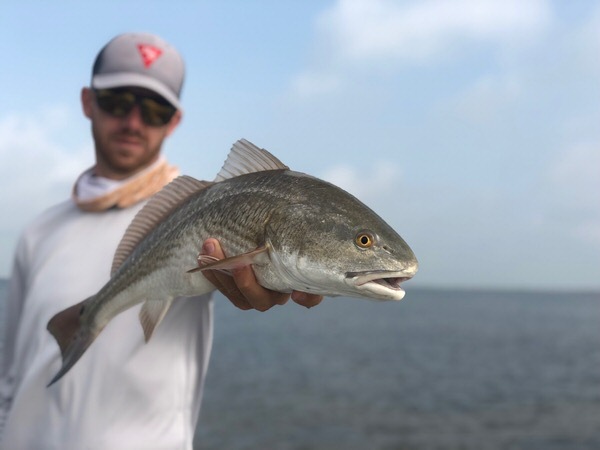 Since our last Rockport fishing report, things have been pretty good on the Texas Coast. We did have a couple of tougher weather days, one of which was Thanksgiving Day. They weren’t too awful though. Mainly just a good bit of North wind and some clouds. Not enough to change much around here really. The days following were outstanding. Calm winds, comfortable temps and a good influx of water greeted all of us that were on the water over the holiday weekend. A couple of the days were fairly foggy early, but with calm winds, seeing fish was still plenty easy to do. As the fog burned off, mostly sunny skies were the norm for the afternoons. Entering this final week of November, we had another single day with some annoying North winds on Monday. Nothing too bad, but enough to make it chilly on the water and blow a bit of water out of the bays as well. This again was followed by another sunny and calm day Tuesday, making for an excellent day on the water. The past couple of days have still been ok. Mostly cloudy skies have been annoying the past two days, but the winds have remained low. So we are still able to see fish out there. Maybe not as well as you would like, but not too bad. The fish haven’t seemed to love the cloudy weather the past couple of days though. Or perhaps the bit of West wind? Either way, we have had a lot of fish laying up. Yesterday (Wednesday) wasn’t too bad. Sure there were a good number of reds that wouldn’t move until you were right on top of them. But you would also have shots and feeding fish here and there along the way. Today, it was a struggle to find fish that were cruising or feeding. There were plenty of fish around, but very few were being active. This made it pretty tough out there, having fish sitting around and unwilling to move until the boat damn near hit them in the head. We did get our shots in today, but nothing like you would expect. Tomorrow is another day… thankfully. And it appears that we are back on track to see plenty of sunshine. Even better, we will warm up a bit as well. All while keeping the winds relatively low. So it’s looking like we should have some very good days coming up here through the weekend and into next week. The water temp on the flats today was between 61 and 63 degrees, depending on where we were. That is a bit on the chilly side, but not too bad. And it’s about what you would expect, after not seeing the sun for a couple of days. So as things warm up and move into the weekend, expect those temps to creep up a bit and get these fish moving around a bit more. As far as where we have been fishing lately… It’s kinda been a little bit of everything. With the winds this light, you can pretty much go anywhere you want and not have to worry about it. So we’ve spent time up as far San Antonio Bay, and down South of Corpus Christi as well. We have been seeing a lot of larger fish in a few of the areas down South lately. Areas of Corpus Christi Bay have been producing good numbers of over slot fish each day for us. Also, there are plenty of good sized drum running around right now as well. But there are certainly good fish spread throughout all of the bays it seems right now. We just seem to find better numbers of them down South this week. Our fly selection has been pretty normal. Crab patterns are first out of the box most days. But baitfish and shrimp patterns are working just fine as well. Those are popular choices if we are fishing over shallow grass for sure. If there are good numbers of drum around, we are sticking to some fairly large/dark patterns with a lot of weight. Many of the drum are swimming in water a bit deeper, maybe 2′ or so. A little heavier fly helps get it down in their zone quicker and easier. Also, it has been pretty common to find a single large red swimming with a few drum. So they have been willing to eat the larger stuff fairly well for us also. Since we have spent a good bit of time around some of that deeper water, we haven’t played around with too many topwater bugs this past week. But we assume those fish in shallow or tailing would still be plenty willing to chase them down. Again, with the improving weather tomorrow and on, you can expect the fishing to be very good throughout the weekend. We will be on the water every day and will do our best to report back and let everyone know what we are seeing out there. Hopefully we can update the Rockport fishing report for the first of December coming up. You can always contact us any time if you would like to BOOK A TRIP or need any up to the minute Southwest Texas fly fishing or Rockport fishing type news. We continue to post on Instagram, Facebook, Twitter and Snapchat. Or perhaps SUBSCRIBE to our YouTube Channel as well. We continually are trying to add more videos and stuff there. We try to keep stuff fresh for those of you that are wishing you were on the flats with us. So be sure to follow us on all our social media stuff. And don’t forget to sign up for our monthly newsletter below.